The University of Maryland, College Park Art Gallery celebrated its 50th anniversary on Feb. 24, 2016 with a memorable art exhibition. Among those attending were President Wallace Loh and his wife, Barbara, on the left; and Prof. David C. Driskell, along with Prof. Dagmar R. Henney, on the right. Photo courtesy University of Maryland Art Gallery, used with permission. David C. Driskell (born June 7, 1931 in Eatonton, Georgia) is an artist and a scholar in the field of African-American art. Driskell is an emeritus professor at the University of Maryland, College Park. Driskell holds a Master of Fine Arts degree from Catholic University and nine Honorary Doctoral degrees. In 2000, Driskell was honored by President Bill Clinton as one of 12 recipients of the National Humanities Medal. David C. Driskell: Artist and Scholar by Julie L. McGee, a book detailing Driskell's life and work, was published in 2006. Driskell is represented by DC Moore Gallery. His first exhibition at the gallery was held in October 2006. Amistad II: Afro-American Art (editor), Nashville: Fisk University, 1975. The Afro-American Collection, Fisk University, with Earl J. Hooks, Nashville: Fisk University, 1976. Introspectives: Contemporary Art by Americans and Brazilians of African descent, curators, Henry J. Drewal and David C. Driskell, Los Angeles: California Afro-American Museum, 1989. David Driskell: a survey: Art Gallery, University of Maryland, College Park, October 21-December 5, 1980, compiled and edited by Edith A. Tonelli, College Park, MD: University of Maryland Art Gallery, 1980. 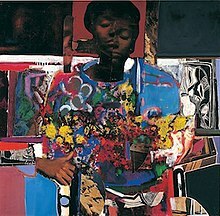 ^ "ArtMakers : David Driskell". The History Makers. Retrieved December 4, 2015. ^ a b "AWARDS & HONORS: 2000 NATIONAL HUMANITIES MEDALIST: David C. Driskell". National Endowment for the Humanities. Retrieved July 19, 2013. ^ Julie L. McGee, David C. Driskell: Artist and Scholar, Pomegranate Communications, 2006, ISBN 0764937472. ^ "DC Moore Gallery, artist page". Retrieved February 1, 2013. This page was last edited on 29 August 2018, at 14:51 (UTC).